The New Year brings new beginnings and hopes for a better world. We are inspired by extra-ordinary people around us, as we continue to emulate their grit, their perseverance and their positive outlook towards life. We bring you stories of 2 such amazing women we met during our travels in India (watch out for the next story…next week). Let us introduce you to “Gudiya” (translates to doll), who is a mother of 4 children and works full-time as a massage lady to earn a living for her family. She has a husband who is often not-so-supportive about family matters and Gudiya toils tirelessly to make enough money to put food on the table for her 4 children. Her children go to a private after-school program, and she pays a subsidized rate for their education. Her main aim is to keep her children off the streets and in a safe house so that they don’t get into trouble with the law! Her expenses are more than INR 10,000 – INR 8,000 a month because she pays for rent, electricity, kids tuition, family’s food, medical payments etc all by herself. To meet these expenses, she works as a massage lady at 5-6 houses each day, providing a massage for at least 1 hour. Besides her paid work engagements, Gudiya is responsible for cooking, cleaning and taking care of entire household! Yes, she is not the only one who struggles to make ends meet – but her perseverance is worthy of mention and celebration. A majority of women in developing countries are engaged in informal work engagements. Home based employed, such as the one Gudiya is engaged is an important source of employment for women. Unfortunately, being engaged in the informal sector doesn’t provide Gudiya fringe benefits such as insurance, pension, and medical benefits. She has to pay for all contingencies in life through her own pocket. Women like Gudiya, who are engaged in informal employment engagements are at a higher risk of poverty. This is because (1) women are engaged in more precarious work engagements that typically associated with low and unsteady earnings, (2) women’s earnings are typically lower than men, (3) women typically work for fewer paid hours than men, because of the unpaid household work they are also engaged in. Despite the odds, Gudiya continues to save a little every month. These are informal savings because she is not aware about formal banking services available to her, and she is not confident about going to the bank to deposit her savings. She also tries hard to keep money away from her husband who tends to squander away the savings on entertainment. So how does Gudiya do it? 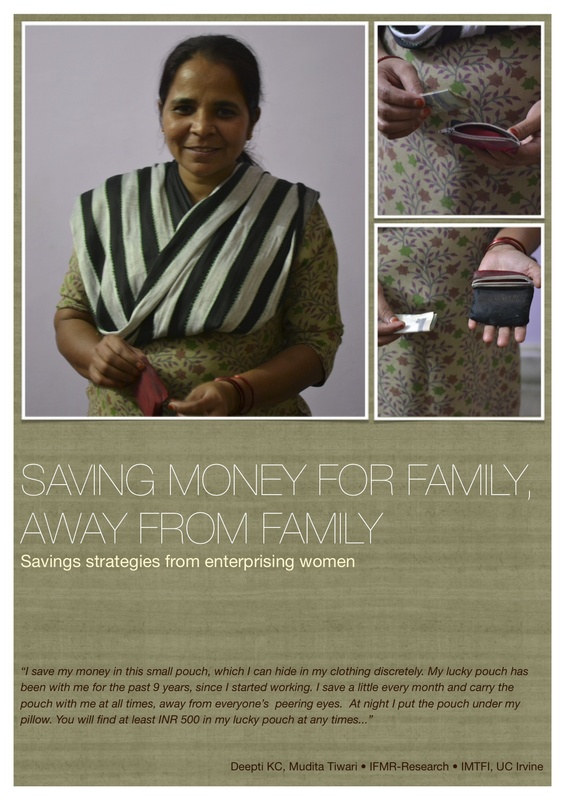 Gudiya discreetly puts away little money each day if possible in her small purse, that stays in hidden pockets in her clothes. She keeps her little purse under her pillow and night, and then back with her in the morning. Her emergency savings have gotten her out of many sticky situations – from emergency payments for health episodes, children’s school uniforms and food rations for home. What’s Gudiya planning next? She wants to save up little by little for a permanent home some day. She wants to save enough to help her sons start their own small businesses, and educate and marry her daughter. Most of all, she is happy about being an important member of the society; she acknowledges her immense self-worth as a wonderful mother and a hard-working modern woman. As Gudiya and many like her continue to make a difference in their lives, please join Vida in celebrating their success as extra-ordinary women! Previous Previous post: Thanks for the Gift of your Support!